Today I am joining in on the Ume dress tour! 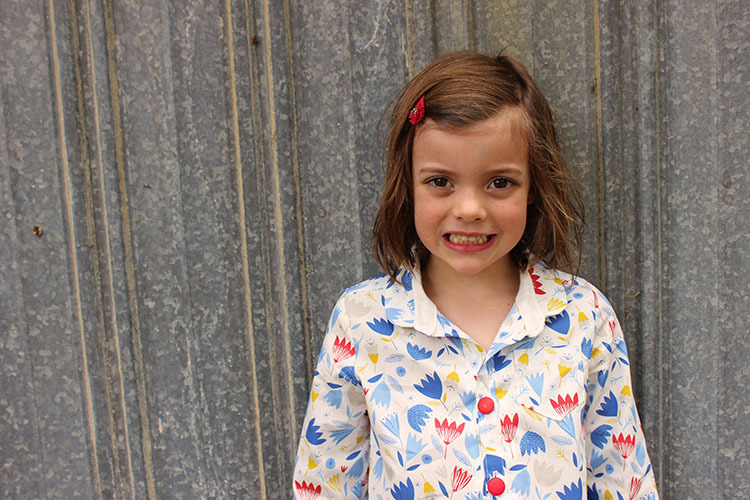 Ume is the latest wonderful pattern by An from StraightGrain. 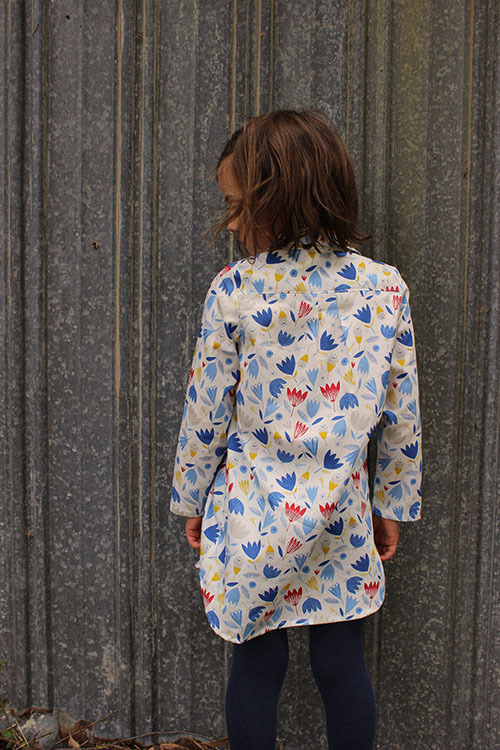 An has released so many great patterns now, and I have sewn them all but one! 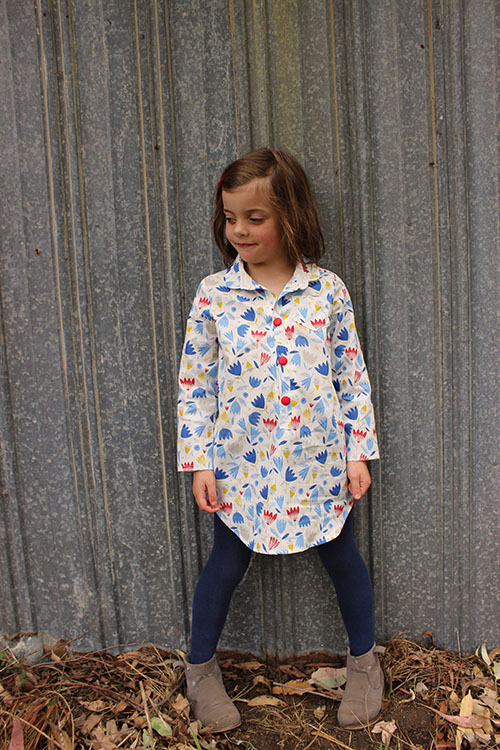 Ume is another winner offering many options for sewing shirt dresses. The instructions are wonderful and a written with great detail. I sewed up the straight dress option with popover placket. You can purchased the pattern in English and Dutch, and it will soon also be released in a paper version too - which I highly recommend. I had a few issues sewing up the dress - not for fault of the pattern, but because I was rushing and trying to get it finished this afternoon while Emily watched a movie, as I had promised her we would do some cooking and play outside on her last Wednesday off school. I unpicked many seams and accidentally ripped the button placket in the process, hence why I have the buttons on the wrong side! Aside from my toils, the dress looks super sweet on Emily and I want to make another one with the gathered skirt. Below you can see the pretty back yoke and pleated detail. You can also sew the dress with short sleeves, sleeve tabs, a full button placket, rounded or pointed collar, tie collar and gathered skirt. See the product details to see all options included in the pattern. 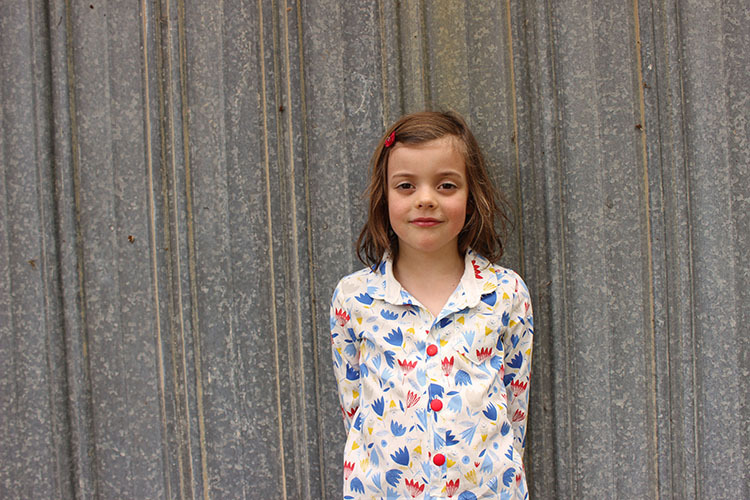 I used some pretty Cloud 9 cotton floral and managed to squeeze this dress out of only a metre of fabric - something that is becoming more challenging as the girls get bigger! I bought the fabric from my local Spotlight - I love that they stock a fabulous range of Cloud9 prints!! Loving Emily's crooked smile below and her new Ume dress! Thank you An for the wonderful pattern! The dress looks super sweet on Emily. Love this print. فوم برد خانه طراحان سام نوعی تخته شاسی با هسته ای از جنس پلی استایرن است که سبک، مقاوم، صاف ، قابل برش، ‏دارای استحکام و مقاوم قیمت فوم برد در برابر رطوبت می باشد.